From the outset, every startup gets really excited about branding. Branding workshops take place to discuss how the company should appear to their target market. These workshops yield logos, colour schemes, one-liners, fonts and boilerplate copy templates amongst other brand assets. But at such an early moment in a startup’s life, it isn’t easy to choose which combination best describes your mission and your brand (we know, we’ve been there). It takes time to draft up your first set of guidelines and assets that accurately encapsulate your brand identity. What do we mean by your Brand Identity? At Pilcro, we believe this is four things. Your mission, your values, your practices and your collateral. In this blog, we are going to concentrate on how your collateral must be chosen to reflect the other three parts of your brand identity. But what is your collateral? It is a combination of your brand assets and brand guidelines. Your brand assets are your logos, colour, fonts, boilerplate copy etc. Your brand guidelines are the set of rules drawn up by the design team and championed by the leadership team that define the look, sound and feel of your company. They define how the assets should be used. As a new company, when you have chosen some suitable brand assets and guidelines, when you choose your email signatures, t-shirts and business cards, when you have ordered some stash, when your website is carefully drawn up adhering to your guidelines, you feel a sense of achievement that you have implemented your brand identity correctly. …as your business grows, your brand collateral can struggle to scale in the same way. It becomes too difficult to maintain or it all ends up in some dusty corner of your file system. The brand guidelines pdf and some old assets become an insufficient framework from which to broadcast that original pure form of your brand identity. Your brand champions have to become brand enforcers as employees begin to cut corners. Small inconsistencies begin to creep into everyday use: the wrong colours or fonts are used in presentations and on the website. A logo with the wrong resolution is downloaded at speed from Twitter. Inconsistent or old email signatures start to be used. It is not that your team do not want to use the brand correctly, but simply that the relevant assets are often not easily accessible, or they do not even know about the updates. These might seem like small things but when over 100,000 new companies are being incorporated every day, it is more important than ever to ensure that your company stands out. Maintaining brand consistency and a strong brand identity not only builds the community around your company but also hits your bottom line. It boosts brand engagement, builds trust and ultimately leads to higher revenue. When brand consistency is so vital to building trust, status and network in young companies (and in fact all companies), why are its blueprints often made so hard to find? Imagine if your brand identity was omnipresent and accessible. Always at your fingertips. Presentations, emails, docs and web content could be on-brand instantly, with logos, colours and snippets just one click away. With brand consistency comes brand credibility and with brand credibility comes growth. This is why we created Pilcro. 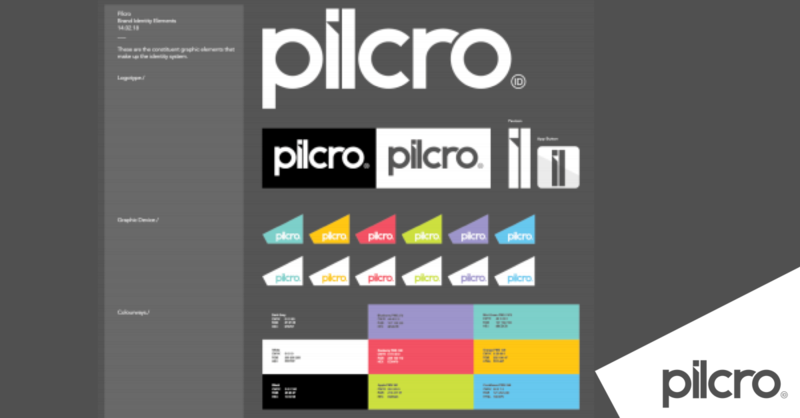 Pilcro allows designers to share a dynamic, up-to-date, accessible brand identity with everyone in the company, in a format that everyone understands and with which everyone can interact. It is your free brand management software for G-Suite. This means that all your logos, colour palettes, typography and boilerplate copy are always to hand. Your brand identity isn’t just for the designers to understand, it is for everyone. And only when everyone at a company understands the brand identity can a company move closer to achieving its mission.